No teams can beat Georgetown in one area: timezones. While head coach Rob Sgarlata might prefer you focus on how many games where Georgetown had a chance going into the 4th quarter, or how they have a sneaky good defense, the truth is nobody can touch Georgetown when it comes to getting players all over the world. Take senior DB Ettian Scott, whose hometown is listed as Okinawa, Japan. Or senior RB Jo’el Kimpala, who hails from the Democratic Republic of Congo. Or sophomore WR Luke Morris, who comes from Honolulu, Hawai’i. If Georgetown’s policy of not offering football scholarships might be seen as a hindrance in some circles, it’s clearly not much of a setback when it comes to getting players that hail from, well, all over the world. In Year 2 of the Sgarlata era, the Hoyas are hoping to make the jump from 3-8 squad to an over .500 team, and challenging for the Patriot League title. Impossible? Some might think so. At media day, the Hoyas were picked 7th out of 7 teams. 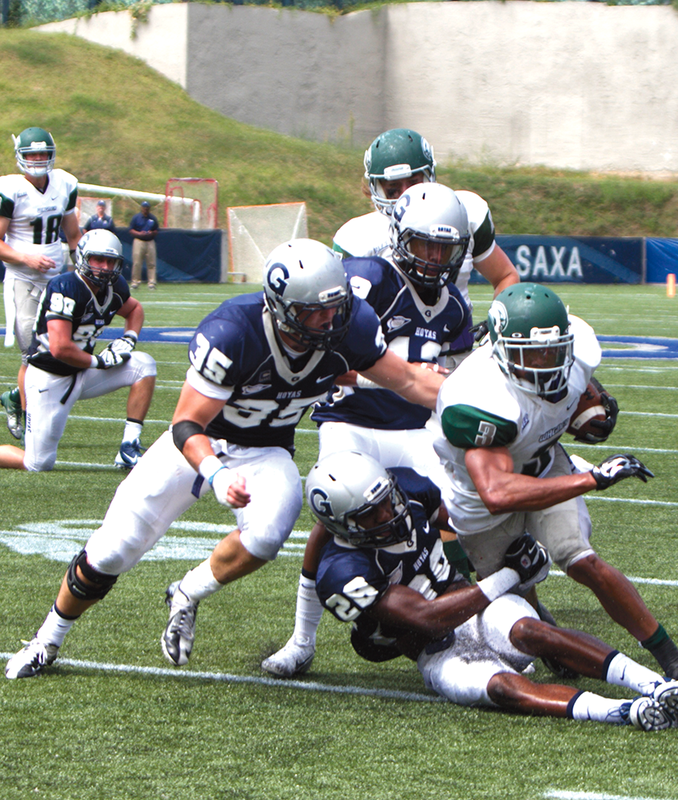 Yet senior LB Matthew Satchell said at Patriot League Media day that this Georgetown team would be a “down and dirty fighting team,” showing that this squad may be a tougher out than people imagine, especially with their tough defense.